I’m studying an Art History Masters with the OU at the moment, so I’m going to do a couple of quick posts related to that. I’ll talk about it in general terms in the next post, but wanted to focus on one aspect at then moment, which is assessment. Assessment has a bad press these days. If you want to be a hipster in the ed tech world, and get lost of cool keynote invites where you say ‘out of the box’ things, then a pretty good line to take is “we should do away with all assessment”. The general feeling is that as soon as you start to assess something you kill it, people start to respond to the assessment rather than learning ‘naturally’, it is a control technique, etc. Let the learner be free. Okay, I’m being a tad sarcastic, but you’ll have seen this kind of thing floating around on blogs, twitter and at conferences. It’s a trendy thing to say. Assessment is for squares. And it is likely true that we over assess children, particularly in the UK, and that a lot of assessment is boring and deemed irrelevant. But learners quite like assessment, it motivates them, and helps them structure their learning. They are operating in an alien landscape often, and assessment acts like a map. If they follow these paths they will reach the goal. Often I feel that the anti-assessment voices are based on their own experience, of being confident, experienced learners, and are not really focused on what learners themselves like. It is also an excellent way to give, and receive, feedback. Which brings me on to my experience (to be guilty of what I just accused others of doing). I’m studying Art History, a domain I know very little about, so although I’m an experienced learner, I’m a newbie in this landscape. I feel quite lost a lot of the time. The forums help a bit, the material is well written and structured. But the assessment is the key. These have been just standard essays so far, nothing radical. But in doing them I have engaged with different material, been forced to structure my thoughts and got to grips with key concepts. I’m just about to submit my second assignment (2,500 words on the concept of style in art history). I did okay on my first assignment, and that was important to find out, that I can do this. I’m also, despite all I know about education (or maybe because of it) not a great student. Assessment is the key manner in which I structure what I have to do, without it I would have wandered away and not come back. The role of assessment is particularly important for distance students who don’t have a lecturer engaging with them regularly. Maybe in the Oxbridge small tutor group model, you can have less assessment because you have such regular interaction, but for distance ed, it’s vital, which is why the OU made it such a central component of their supported open learning model (soon to be rediscovered by a MOOC company near you). I know a lot of assessment is boring, but just wanted to give it a thumbs up from a learner perspective. 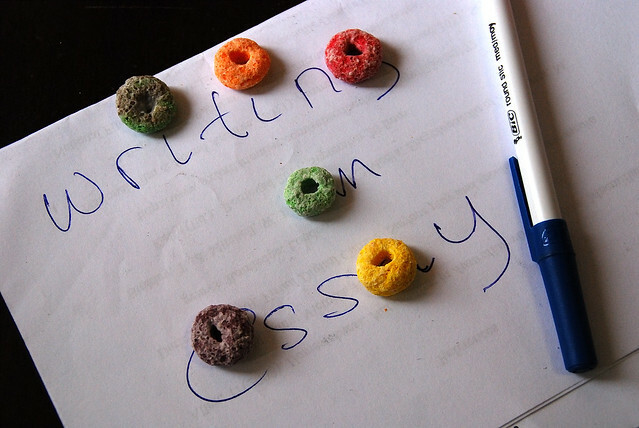 Essays are useful – who knew? That might be true, but in a subject where I feel very out of my depth, I’m not sure I’m good at being assessed. And actually I think assessment is most useful to learners who lack confidence, as it helps them know what they should be doing, structure their work, and give ways of improving. I think the anti-assessment voices often assume a lot of basic learning skills that many new students don’t have. I think there has to be a balance – too much assessment is a bad thing as can be too little. Yes I’m sure that’s right – I didn’t want to go into the whole assessment literature though, my point is more that it was enlightening to see it from a learner’s perspective, and maybe we’re too harsh on assessment overall as trendy educators. Actually, if you feel out of depth in the subject, then the assessment might be the most comforting and familiar part of the course (a place where you know well even if you don’t understand the material). Also, I’m sure you know the dangers of citing a single study from 2002 in order to substantiate a sweeping claim such as “learners like assessment”. To be fair, it’s a blog post about my experience of being a student, not a journal article. But actually, our experience at the OU is that assessment is one of the course elements most highly valued by students. I am also a newbie in an MA History land http://bit.ly/1MVOZ7v and I totally agree with you about that being lost feeling. What IS historiography and historicity? Why does it matter whether or not there were Scientific/Industrial/Agricultural revolutions? etc etc etc. Assessment is a vital component for getting a sense of the framework of any subject. I don’t need it for motivating the reading but assessment tasks make you actively construct an understanding of what the subject is and why the subject is important (although the question needs to be carefully structured so as to tease that out from you) and how to write for a discipline. But, for assessment to enculture feedback is vital, and so are learning objectives, and guides to the subject, all the things that the OU do so well of course. Hi Kathy – I know how you feel! I did an MA in History a couple of years ago and that historiography/historicity thing is exactly one of those terms people who have come through undergrad bandy around like we all know what it means 🙂 I think you put it very well that assessment makes you actively construct your understanding, that’s what has been crucial for me. I feel this way too. Except when I occasionally don’t. So many moving parts here: age, discipline, domain, course or event, existing motivations, level of performance…a lot of context to take into account. As usual, it’s complicated. But, like many trends in education and technology, the prevailing winds are often in favor of an over-correction. Hi Chris – I think that’s very well put, it is probably this over-correction I am responding to. I’m amazed nobody mentioned the good old formative vs summative assessment distinction (formative occasionally also called assessment for learning). The problems are not with the idea of assessment but with its forms and uses. Not everybody is good at essays – some people prefer quizzes, others interviews, others videos. The idea of checking in on progress is something most learners will appreciate. What they hate is the randomness and capriciousness of the final exam, a mid-term or a standardized test (gawd help us!). When your future, money and self-esteem depend on the luck of the draw, how you slept the night before or a pointless last-minute cramming session, I think there’s a lot to dislike about assessment. Particularly if the results matter to the livelihood of other people – what you end up is teaching to pass the assessment rather than assessing what has been learned. There’s nothing NOTHING good about assessment that you would fail if somebody sprung it on you three months later. Assessments designed by people who measure how similar you are to them (or some ideal based on them) at the end rather than how you are as you in the world in which you live. I quite like the odd quiz or check in on how I’m doing – but I HATE assessment and so should you. What an odd statement I have to say. Assessment really helps structure a course, develop skills, provide feedback, motivation and points of engagement. I wasn’t defending one form of assessment, but assessment in general, which is actually a very useful learning tool. Try being a student in an unfamiliar domain, and you’ll find it extremely useful, as do most learners who are unsure what they’re supposed to be doing. …there’s a difference between being a student and being a learner. The underlying reality may be the same but the former is approaching learning from an institutional perspective which is being fed into a sorting hat of assessment at the end, reducing all that learning into a few numbers. If you’re just a learner with no stake in the outcome other than learning something, you will approach assessment differently than if you’re a student who has to fit into a chain of accountability that is just as much institutional as pedagogic. If you conflate formative and summative assessment, you cannot appreciate why students with some exceptions hate it – it all depends on the stakes. I often use quizzes or other assessy techniques in my teaching precisely to achieve the goals you mention – and it takes all sorts of contortions in convincing students that this is ‘not a test’. I’ve administered assessments purposely designed not to be studied for and not to work like tests – yet, (most) students always balked at them as tests unless they were explicitly marked as not counting towards a mark. Even portfolios often fall in this ‘looks too much like assessment’ trap. I highly recommend reading Rebekah Nathan’s ‘My Freshman Year’ in conjunction with Howard Becker’s ‘Boys in White’ to see how students really navigate the institutional contexts of learning. I’ve also read through the study you cite in support of the claim that ‘learners like assessment’ and it says pretty much what I’m saying – students don’t like exams or traditional (boring) assessments but use what assessment there is to help them structure their learning (witness their preference of multiple-choice over open-ended formats). But you made it seem as if they’re clamoring for assessment – no, they want structure, clarity and feedback on progress. Assessment is just a schooley way of achieving that. You could say that any feedback including a pat on the back is assessment but then you again need to distinguish summativeness and formativeness as well as other dimensions of assessment. I hate assessment both as a learner and as a teacher. In both roles, I like and appreciate a feedback loop for which assessment-like activities can be a fine vehicle. Unfortunately, many have been polluted by the prevailing use of assessment for ends other than the feedback and structure it can provide. Frankly, I wish there was more opportunity for assessment in daily life. I read a lot of things, and I’m not sure if I fully understand them. Writing down my understanding of those things has helped me catch problems in my thinking, but I’d love experts to come along and find the less obvious things I get wrong. I like, treasure even, assessment too – as both a student and teacher! However, I deeply dislike examination (assessment of memory) and teaching to help students pass examinations. Hi Mandy, yes I agree, and I probably should have been clearer by what I mean by assessment. I’m not a big fan of exams (they can be useful in the revision process synthesising course contents, but there are better ways to do that usually), and that report I linked to suggests most students don’t like them either. An end of course project can be very useful though.